If you've been searching for professional plasterers in Taunton Somerset, then look no further! We have a great reputation for quality plastering at prices everybody can afford! Why go anywhere else when everything that you need is right here with King Plastering! All of our Taunton plasterers are fully qualified and have years of experience in the trade, so give us a call and we will provide you with a free estimate for any plastering jobs that you require for your Somerset home. 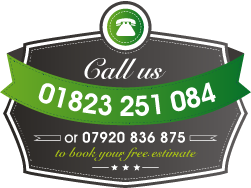 We offer quick response rates for plastering emergencies too, so call us now! If what you're searching for isn't listed, call us anyway as our plasterers offer more services for our customers across Taunton Somerset. Whether you need plastering inside your Taunton home, rendering to make the exterior more attractive or decorative plaster work to make your home look more luxurious, cal our plasterers today and get a free estimate. You can reach us on 01823 251084 today! Our expert plasterers cover all areas of Somerset and it's surrounding areas with quality plastering services. Click the link below to see the areas covered. "Outstanding work and value for money, they took great care and pride in the job at hand and cleaned up after themselves, excellent!" Copyright © King Plastering - No part of this site may be reused without permission of the owner.